Single-Edge Downcut Super O: The polished flutes on these bits has a razor-sharp cutting edge and easy chip evacuation. CED 1/16" CEL 1/4" Shk 1/"8 OAL 2"
Single-Edge Downcut Super O: The polished flutes on these bits has a razor-sharp cutting edge and easy chip evacuation. 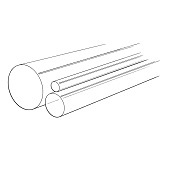 CED 3/16" CEL 3/8" Shk 3/8" OAL 2"
Single-Edge Downcut Super O: The polished flutes on these bits has a razor-sharp cutting edge and easy chip evacuation. CED 1/4" CEL 3/4" Shk 1/4" OAL 2"
Single-Edge Downcut Super O: The polished flutes on these bits has a razor-sharp cutting edge and easy chip evacuation. CED 3/8" CEL 1-1/8" Shk 3/8" OAL 3"
Single-Edge Upcut Super O: Like the downcut style above, this bit has a razor-sharp cutting edge and easy chip evacuation. CED 1/16" CEL 1/4" Shk 1/8" OAL 2"
Single-Edge Upcut Super O: Like the downcut style above, this bit has a razor-sharp cutting edge and easy chip evacuation. CED 1/8" CEL 1/4" Shk 1/4" OAL 2"
Single-Edge Upcut Super O: Like the downcut style above, this bit has a razor-sharp cutting edge and easy chip evacuation. CED 1/8" CEL 1/2" Shk 1/4" OAL 2"
Single-Edge Upcut Super O: Like the downcut style above, this bit has a razor-sharp cutting edge and easy chip evacuation. CED 3/16" CEL 5/8" Shk 1/4" OAL 2"
Single-Edge Upcut Super O:Like the downcut style above, this bit has a razor-sharp cutting edge and easy chip evacuation. CED 1/4" CEL 7/8" Shk 1/4" OAL 2-1/2"